In optical measurement technology, different measurement devices are used to test optical fibers. In addition to analyzers and power measurement devices, optical sources that can be readout with the help of monitors are also used. The product family of this optical hand helds comprises LED sources and laser sources for different wavelengths. In combination with an optical power meter these devices are, thanks to their easy handling, perfectly suited for quickly checking optical cables and components. The Test Set 525, made by Tempo, offers a laser source, an attenuation, and a return loss measurement device in one compact unit. With the AUTOTEST function key bi-directional measurements of the insertion and return loss can be performed. 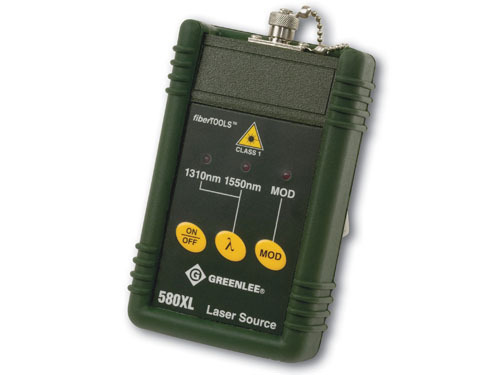 The laser source can be switched from 1310 nm to 1550 nm. With the programming of threshold values good / bad checks can be performed very quickly. The device stores up to 1500 measurement values which can be read out via an RS232 interface. Based on the fast spreading use of fiber optics in industrial data systems Tempo has developed a selection of fiber optical test and measurement devices. With these devices, developers, network administrators, and systems installers can reliably check their fiber optical systems in many different ways. The main focus is the use of these devices together with 200- / 230-µm HCS® fibers and 1-mm plastic fibers. Due to the large number of adaptors the devices are compatible with VERSATILE LINK / V-PIN, TOSLINK / J series, and SMA and ST® connectors. A 660-nm LED source, labelled 253B together with the measurement device 553, recognizes the loss inside a fiber stretch. All plastic and quartz fibers with a diameter of up to 1 mm can be checked with the large area Si-detector of the optical power meter 553B. Two alkaline batteries guarantee operation for more than 100 hours in the field. The same detector is also used in the table version 577L of the optical power meter. This device is suitable for the surveillance of production lines, quality assurance, and laboratory applications. It can be controlled by an external computer via an RS232 interface.